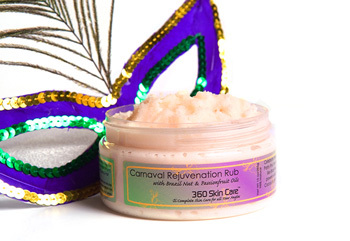 Celebrate the passions of Rio de Janeiro with 360 Skin Care’s Carnaval Rejuvenation Rub. Party thru the night after polishing away those dead skin cells with a burst of nourishing oils like Brazil Nut Oil and Passionfruit Oil. Brazil Nut Oil is known for it’s free radical fighting powers while Passionfruit Oil is recognized for it’s ability to sooth and condition the skin. Cocoa Butter and Guava extract replenishes skin with vitamins and nutrients. Unlock your skin’s potential while giving your skin a reason to celebrate.